The new season has prompted me to get blogging again. As many experienced bloggers probably now, once you’ve had a break, it can sometimes be difficult to get back into it again. Add dark nights to make taking pictures difficult, long working hours and a lack of inspiration and the problem is just compounded. The majority of these have come from the last trip to Deutschland. We still can’t quite believe just how much we brought back this time. 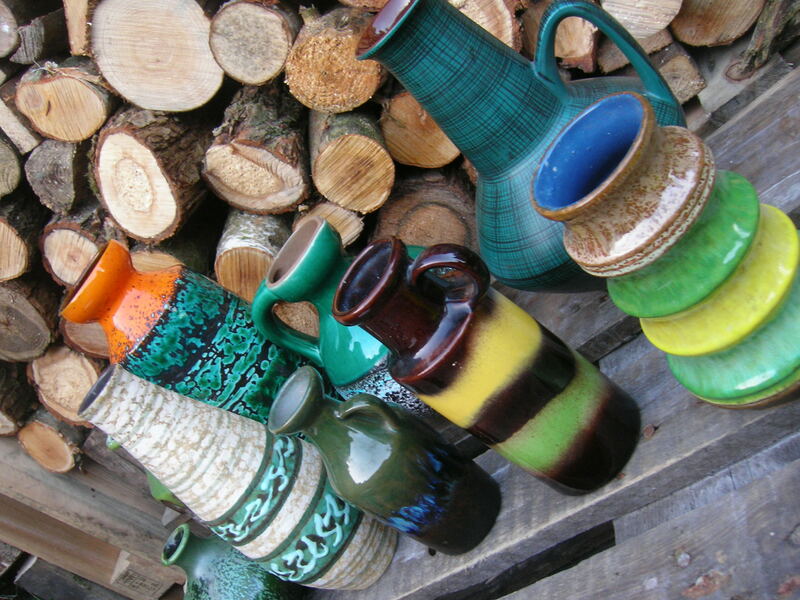 Every time someone comes to visit, they get hauled out into the garage like it’s a prize pig… prize pottery at least. He’d tidied up a bit when we went round at the weekend, but there was still a huuuuge pile of logs and wood to be sorted out. Not that we minded at all: we’ve now got enough wood to keep us going until this time next year, I’m sure of it. And he’s sent me a picture today of yet some more he’s got for us. Amazing. 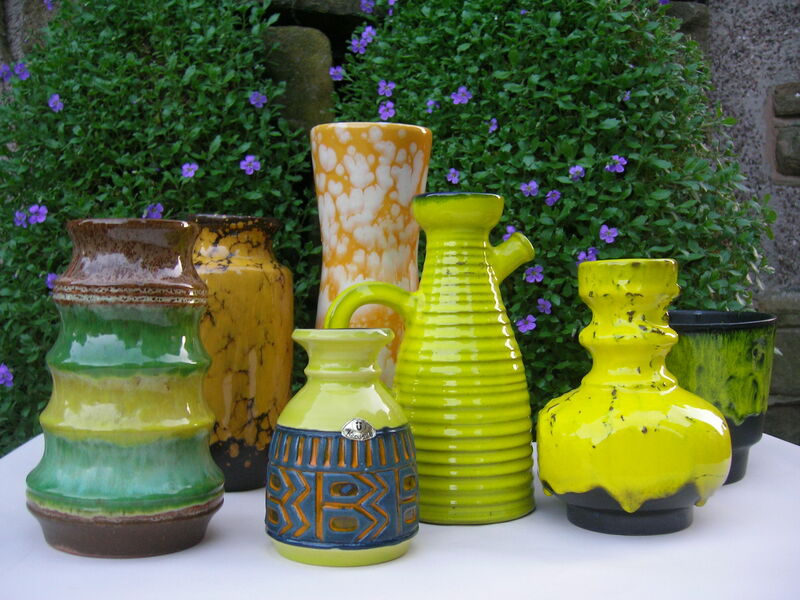 I’m not usually a big fan of yellow pottery, but mingled in with the greens – and, to be honest, not being particularly yellow yellow – these look quite lovely. I also like the contrast of the purple flowers on the bush behind with these colours. It’s probably a good job that Aidan has found another use for the pile of logs. If this warm weather continues, we’re unlikely to actually use the new stove much once it’s installed. At least that job will be done and should give us the impetus to start other renovations and decorations. Which is your favourite pot from the ones in the pictures? 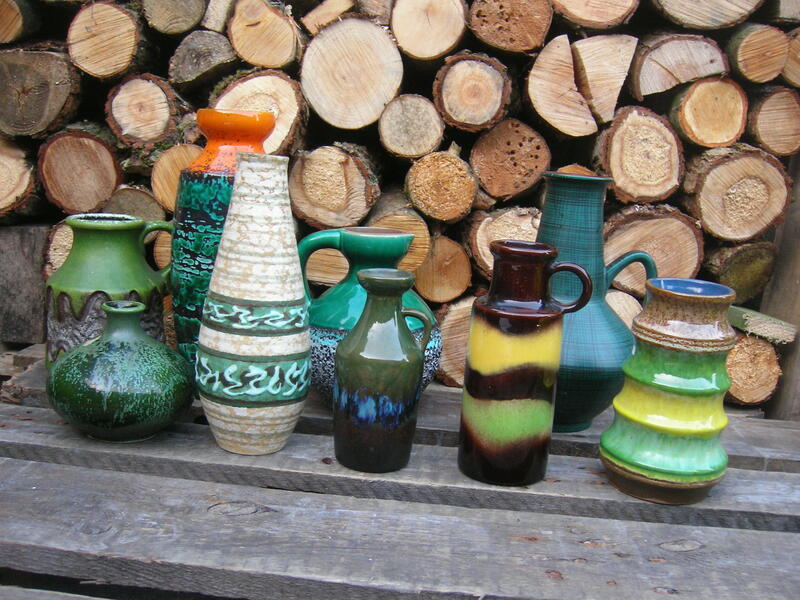 Mine’s the green and black, 1950s style Carstens in the green selection, and the fairly neon U-Keramik piece at the front of the yellow picture. very interesting and unusual (to me) colours Chartreuse is one of my favorites. Hi Emma, nice to see you blogging again! Funny we also gave log overload sadly having had 2 very big trees taken down. Seems crazy buying wood this winter as it has to dry for 2 years. Completely agree with your choices but also love the little yellow pot with Aztec design. 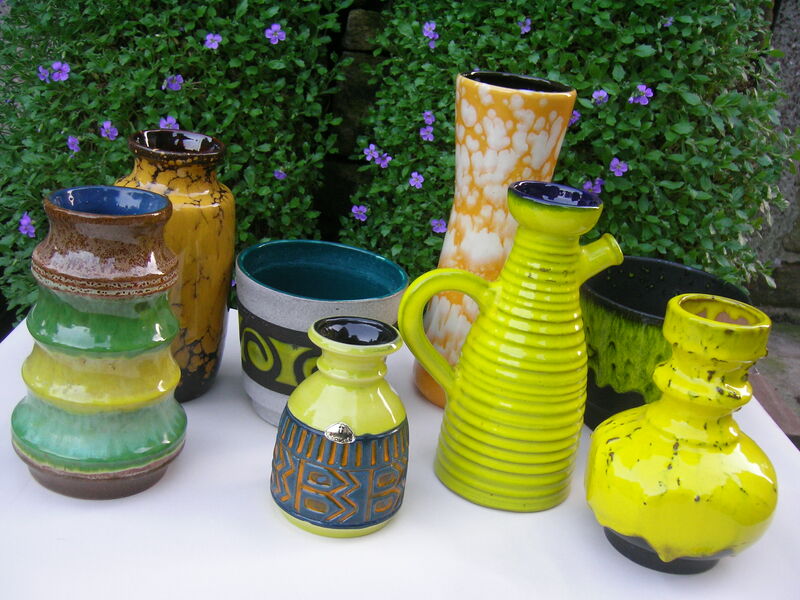 I too am not normally a fan of yellow pots, these look great though. Me neither but just thought it would be a seasonal post. Between my dad and Aidan,the wood is definitely taking over! Hello, found your blog while trying to identify a piece of West German pottery I just bought today. A very sweet local fellow cleans out houses and I get the BEST surprises when I go sifting through the boxes and bags he has. Still haven’t I.D. my piece, maybe if I get my act together, I will take a pic and ask for your help. It is 17 inches tall and someone thought it is an umbrella stand, but it might be a floor vase. It is a great green with some crazing, but the top and bottom have a metallic brown that looks like raku. The reason I am writing, is you mentioned in your “about me” piece, that you listen to BBC Radio 6 and I am loving it!!!! I grew up during the 50’s here in the states, so you have sent me a gift. Thanks!